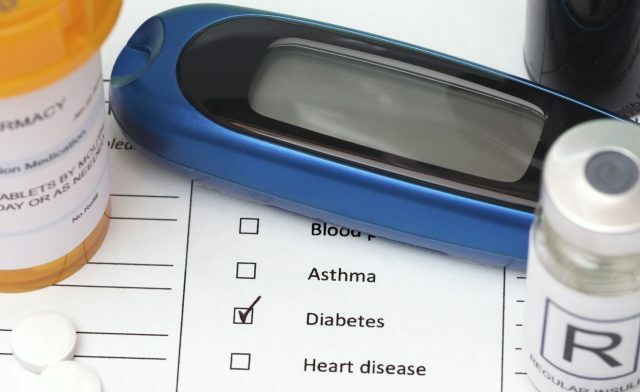 (HealthDay News) — For insulin-treated patients with type 1 and type 2 diabetes, hypoglycemia is associated with increased risk for cardiovascular (CV) events and all-cause mortality, according to a study published in Diabetes Care. Kamlesh Khunti, MBChB, PhD, MD, from the University of Leicester in the United Kingdom, and colleagues conducted a retrospective cohort study using data from the Clinical Practice Research Datalink database for insulin-treated patients with diabetes. The authors examined the correlation between hypoglycemia and the risk for CV events and all-cause mortality. The researchers found that the hazard ratios (HRs) for CV events in those with type 1 diabetes were 1.51 (95% CI, 0.83-2.75) for those with a history of CVD and 1.61 (95% CI, 1.17-2.22) for those without a history of CVD before the index date. The HRs were 1.60 (95% CI, 1.21-2.12) and 1.49 (95% CI, 1.23-1.82), respectively, for those with type 2 diabetes. The corresponding HRs for all-cause mortality among those with type 1 diabetes were 1.98 (95% CI, 1.25-3.17) and 2.03 (95% CI, 1.66-2.47), respectively, and 1.74 (95% CI, 1.39-2.18) and 2.48 (95% CI, 2.21-2.79), respectively, for those with type 2 diabetes. “Hypoglycemia is associated with an increased risk of cardiovascular events and all-cause mortality in insulin-treated patients with diabetes,” the researchers wrote. Khunti K et al. Diabetes Care. 2014;doi:10.2337/dc14-0920.